Nicholas O’Brien interviews founders of Net Artist Daily Anthony Antonellis and Arjun Srivatsa. Arjun Srivatsa I started @netartistdaily because I wanted to anonymously send notifs to my favorite artists. 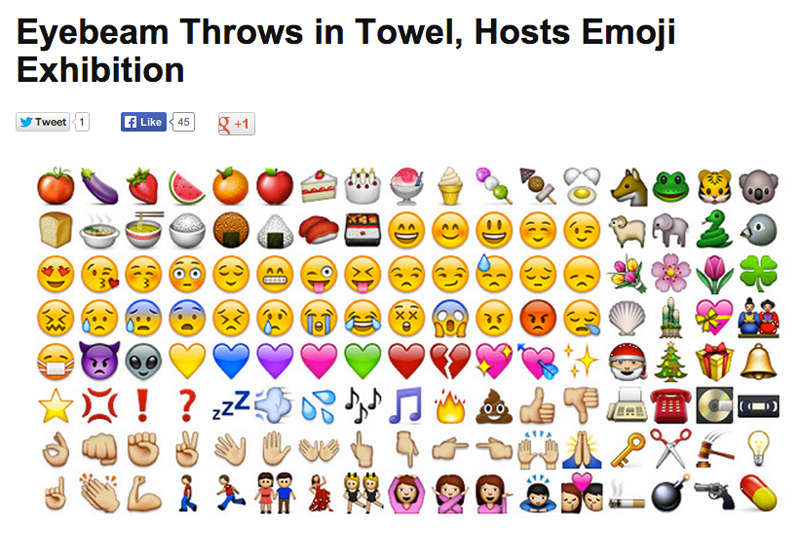 The tweets include familiar net art rituals as well as common everyday tasks. Most of my art projects are based around defining shared actions, objects and experiences within communities. Net Artist Daily started as a fan project because I’m a #netartfanboy. This summer, I played a show at Tritriangle in Chicago. As I drove down Milwaukee Avenue, I saw Nick Briz enter a Jimmy John’s and order a soda. It reminded me of @netartistdaily but on a more sensationalized level. My tourmate and I joked about taking a pic of him and sending it to TMZ with the headline “Famous Multimedia Artist Addicted to Fast Food.” He saw us and waved and we waved back and drove off. 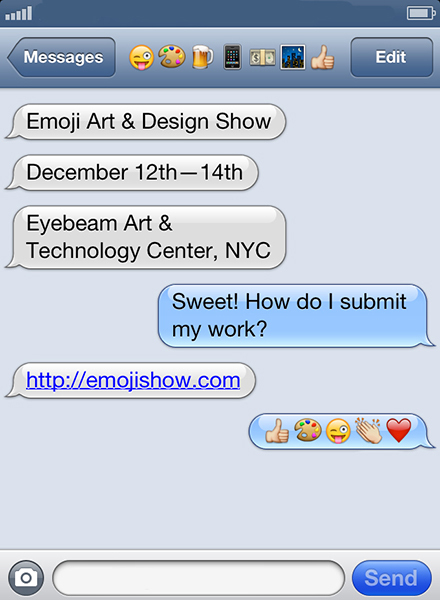 A week later at Debora Delmar Corp’s show at Sadie Halie Projects I told Anthony that I was @netartistdaily. He mentioned how he’d been thinking about creating a net art Huffington Post. Kismet etcetera. Anthony Antonellis This summer, when a project of mine broke viral, I watched how news tabloids sensationalized the story. Those sites are interesting because their use of link baiting keeps you clicking and reading what are otherwise blasé articles with trivial content. 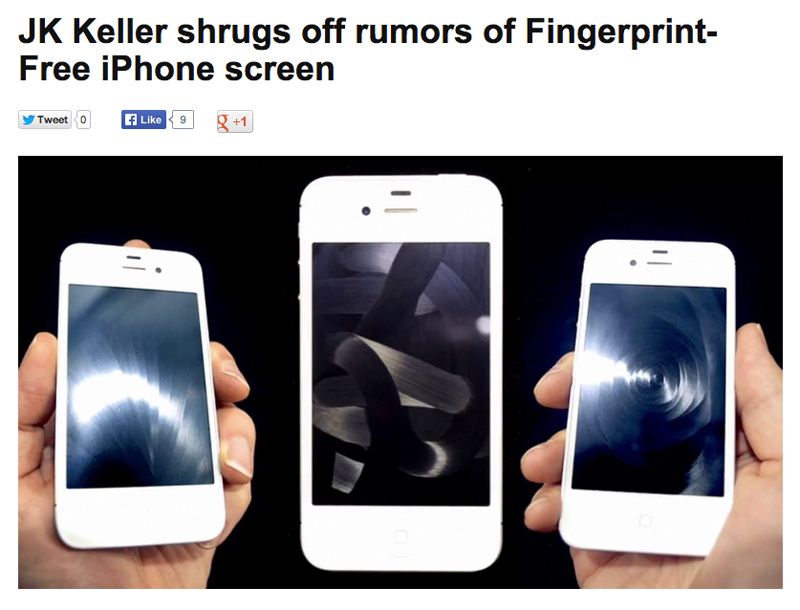 Net Artist Daily emulates those tabloids with its link bait to nowhere. For a ‘scene’ like net art—something that is everywhere covering social networks like sap—why not elevate it to the level of celebrity by glorifying both its real accomplishments and its tawdry moments. 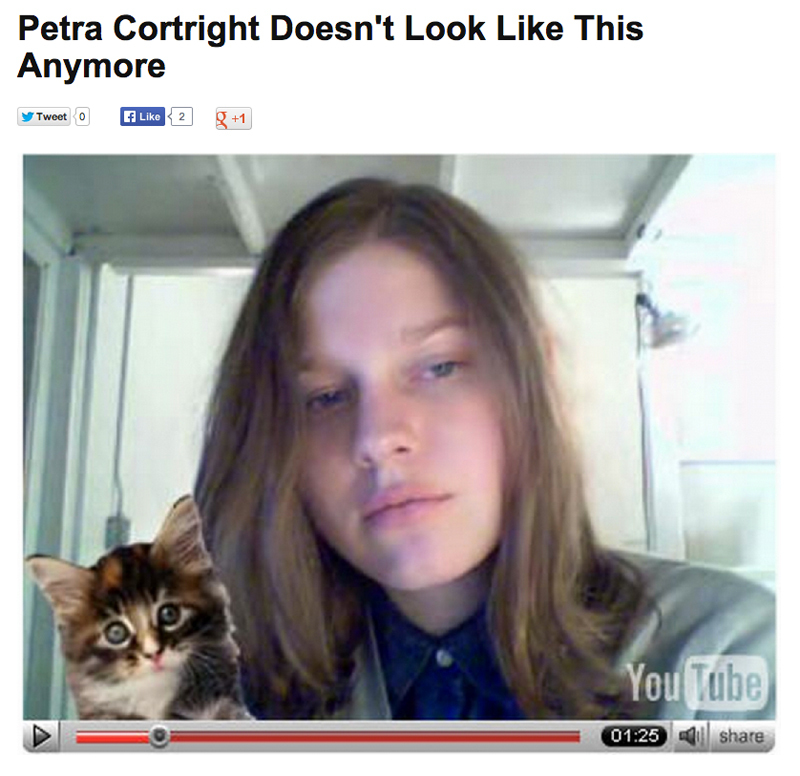 Originally we compiled a list of popular headlines, one of the first was “so-and-so doesn’t look like this anymore”, which became the Petra Cortright headline. Early on the stories weren’t grounded in reality, and then we decided to base the headlines in truthiness. The commentary of the project is poking fun at the artist/critics/curators in a loosely defined net art scene, but not in such a way that aims to actually suggest any kind of outright malice. What was important for you with regards to tone in the project? AA The site’s tone was influenced by Horrible GIF, The Pulse, and artf0rum. It’s also very similar to Slanderous, but I didn’t know about that site until after we launched. The maliciousness is definitely there, but comedy is at the forefront, and that’s how we want information to be delivered. AS The tone is a mix of 😛 and 😀 but we kept things :X so that people wouldn’t get :/ The sneaking suspicion in relation to our identity drove readers to develop conversations on social media which in turn brought more eyes to the project. The Twitter blurs the lines of reality and fiction by being as bland as possible. It’s an attempt to fabricate real events to the point where the subject tries to remember if whether or not they performed these actions. I wanted to be the phantom vibration in net artists’ jeans. How has the tone of the project changed over time? AA When the site launched I thought we would get maybe the same couple hundred or so daily visitors that patronize netartnet.net. But the site had over 20k visitors in the first three days. With so many of the external links being clicked it became apparent that it could also be used to promote useful information through sensationalism. Net Artist Daily puts some vitamins in the gummy bears. AS We wanted the posts to be daily news, so the tone was generally dictated by what was trending at the time. The project might have had a different voice had it been released at the beginning of gallery season but we were able to produce content by commenting on the mundanity that gets passed through social media platforms. Weather is our biggest tonal indicator. Shouts out to Mom Nature. Is there any pointed critique that you two intended when putting this project together? Already some people have commented on twitter that the project is not intended to be critical, while others have argued that there is a undertone of criticality within some of the posts. If you are being critical, what kind of commentary do you hope to bring to this community? AA Net Artist Daily is a scene-selfie. Unlike tabloids, Net Artist Daily is meant for the same people its writing about. Everyone likes reading about themselves and finding out about other people working in their same conceptual universe. Although, the link baiting probably pulls in loads of people who see the headlines in their feed and didn’t know what they were clicking. 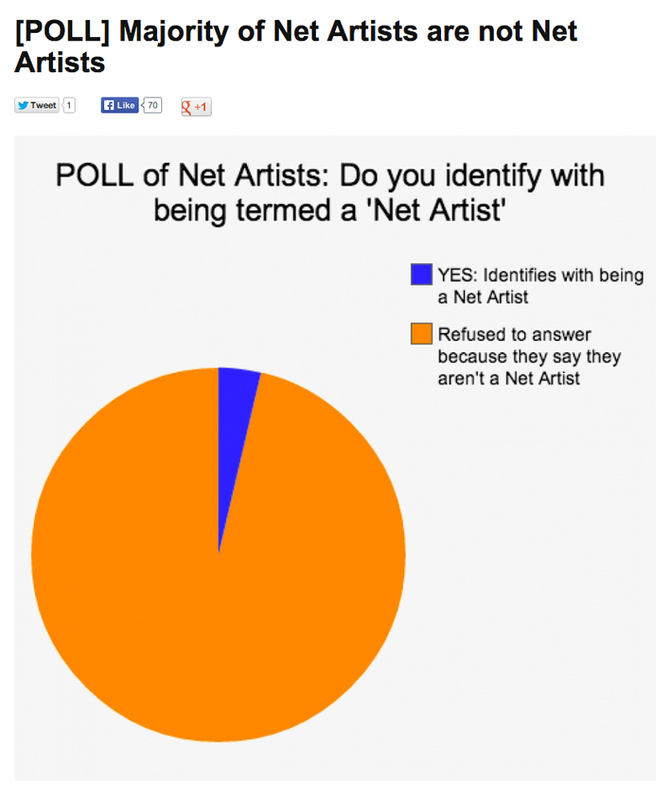 One of my favorite posts in the project is about the poll of net artists not identifying with the term net art, or else outright refusing to respond to such a poll. Can you talk about your own feelings towards identifying with this term? Is identifying with net art passé? Or, in another way, is your use of that term – and post-Internet – a way of talking about this movement/moment/community? AA Some don’t like to affiliate with the term net art because they think its an insular or self-marginalizing genre. That criticisms is largely a reflection on cliques. I think its silly to argue you’re a net artist or not a net artist, you wouldn’t say you don’t like the internet because you saw a bad forum. For the most part you’d have to explain to the general public what net art even is before you could say I’m that, or I’m not that. I believe in ‘big tent’ net art. I use the term to describe a trajectory rather than an approach. I like reading the term post-internet as post-net-art, I see all the lines merging, not forking. AS Net art is a poor signifier. The things that Vince McKelvie makes are so much different than the things that Bunny Rogers makes. Using it as a generic descriptor doesn’t seem to work. I think that identifying with this term is more of a way of identifying with the community. It’s an acknowledgment of the fact that a lot of our mutuals produce art online. We’re just naming our collective newsfeed. I’ve always felt that humor is a great way of bringing together disparate narratives or communities, and I feel as though that idea is somewhat central to the project. At one point, there seemed to be much more of a cohesiveness within this community. However more recently, that togetherness has somewhat splintered into various sub-communities and selective affinity groups. Do you see the project as an attempt to bring those people back together? Or else, is there any intention to think about what has changed in this community since 2-3 years ago? AS We figured that over-the-top satire was the most widely relatable tone for our readers. The critique is to try and break people’s brow in order for them to realize that this community was largely built on a grin as opposed to the established art world’s scowl. It’s something everyone could share~. AA There is a lot of writing about net art; however, the majority of the artists aren’t writing essays, even though they might have strong opinions about what is or isn’t happening. Because of this, I think there is some bloated importance given to certain texts, and some personalities branding too much of the multi-authored achievements as their own. In its small way, Net Artist Daily puts the big brackets back around everything, redistributing fame to everyone, and using yellow ‘link’ journalism to poke fun at the conjecture.